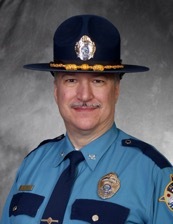 It is with great pleasure that I announce that our newly elected President of the Alaska Chapter, Barry Wilson (Session #244) was recently appointed Colonel, and Director of the Division of the Alaska State Troopers. Barry is certainly up to the task and I have promised to assist him with the chapter requirements during this very busy time in his career. Colonel Wilson is going to do an excellent job in both positions, as well as with the other charitable organizations for which he volunteers. Barry has been with the Department of Public Safety since 1990 and he worked in patrol, investigations, headquarters and rural patrol command. He is excited about the opportunity to work with his staff and the entire department to improve morale amongst the ranks, improve training for all, and develop a strategic plan to make certain effective staffing is available throughout Alaska. Colonel Wilson’s last position with the Alaska State Troopers was as the commander of C Detachment in Anchorage. Captain Andrew Merrill (Session #257), our current Secretary/Treasurer and commander of the Village Public Safety Officer program with the Alaska State Troopers has been assigned to command C Detachment.. We are very proud of Andrew as he was one of eight distinguished graduates, as well as the graduation speaker during his National Academy session. Andrew joined the Alaska State Troopers in 2002 and he has worked in various assignments to include judicial services, patrol, and rural investigations. Andrew is a certified instructor through the Alaska Police Standards Council and he was one of our excellent presenters on the use of force at our 2018 Executive Development Conference. Good luck to both of these outstanding professionals as they lead us into the future of policing here in Alaska. Barry decided to run for President before his two-year term as Vice President of the Southcentral Region had concluded. The Board of Directors unanimously voted in favor of appointing Deputy Chief Ken McCoy (Session #265) from the Anchorage Police Department to fill that seat for the remainder of Barry’s term. For our first meeting of 2019, Barry was out of town, which by our chapter bylaws left Ken, at his very first meeting of the board, in charge of leading the meeting. He ran it professionally and seamlessly. Ken is an excellent addition to the Board of Directors. 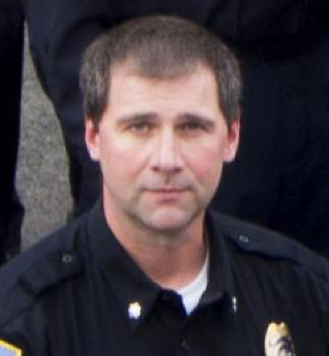 Ken began his law enforcement career with the Anchorage Police Department in 1994, where he has served in command assignments in patrol, investigations and internal affairs. He was promoted to Deputy Chief in 2017 where he oversees all operations and administrative activities for nearly 600 sworn and non-sworn employees. The Alaska Chapter held their annual meeting on December 4, 2018 at the Hilton Garden Inn in Anchorage. The meeting was well-attended and we were honored to have our National Executive Director, Howard Cook in attendance. Howard gave an excellent report on what is happening at the National level with the NAA. Our Youth Leadership Program participant, Rivers Rogers provided her report, along with photos of her experience from Quantico in June. It was moving when Howard presented Rivers with National’s commemorative coin. Rivers’ parents were in attendance and it was a very proud moment. Thank you to Rivers for representing Alaska’s youth so well, and thank you Howard for recognizing her. 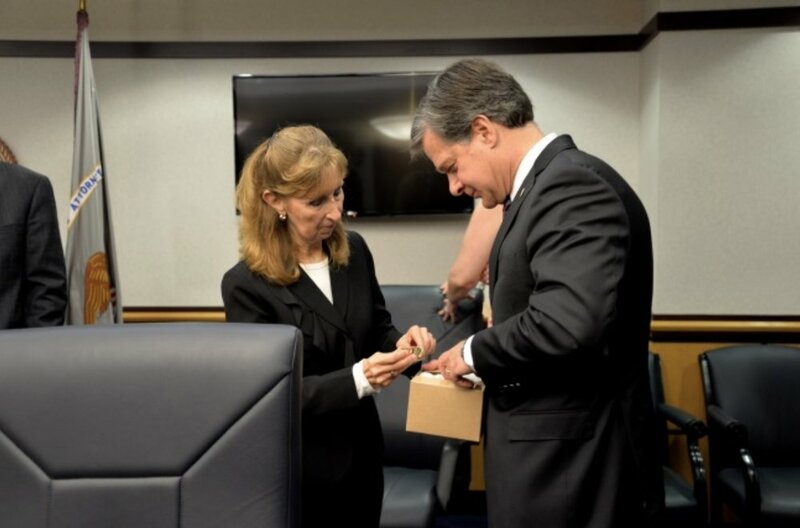 When Director Christopher Wray was in Anchorage in August he told us that he agreed that the NA is the crown jewel of the FBI. We believe the Youth Leadership Program is the Alaska Chapter’s (with our comparatively small contribution to National’s). Rivers appreciating her Uncle – Kenai Police Dept. Lt. Ben Langham (Session #268) for his recommendation and support. Sean McGee (Session #202) in the background serves on the YLP Selection Committee and takes over as Chair in 2019. As of January 1, 2018, I will become the Past President and Alaska State Trooper Captain Barry Wilson (Session # 244) is stepping in as President. Northern Region Vice President Sean McGee (Session #202) won his second two-year term and Anchorage Police Department Deputy Chief Ken McCoy (Session #265) was unanimously voted in by the board to serve Barry’s last year as Vice President of the Southcentral Region. We were pleased that Special Agent in Charge Jeff Peterson, recently assigned to Alaska, attended the meeting and gave updates on the FBI activities. He honored us by swearing in the new board. SAC Jeff Peterson shakes hands with Vice President of the Northern Region, Sean McGee. Past President Shirley Coté looks on after Mr. Peterson swore them in, along with new President Barry Wilson (on the phone). Our annual Executive Development Conference was also held at the Hilton Garden Inn - December 5th through December 7th. Incoming President Barry Wilson had to be at a different conference, however, he helped a great deal beforehand and solicited the help from his wife, Elizabeth and granddaughter, Sahara to put the attendee amenities together. Shirley’s daughter, Morgan Warner has helped her Mom with conferences since she was little. This year we chose 4-pistol gun cases for something different from the traditional notebooks and attaché cases. Thanks to 5.11 for some of the contents that are always a hit – socks and knives. President-elect Barry Wilson, Morgan, Sahara and Elizabeth. We were able to provide to our 90 registrants and members some excellent presenters. Our very own board members, Alaska State Trooper Captain Andrew Merrill (Secretary/Treasurer, Session #257) and Alaska State Trooper Lieutenant Chad Goeden (Vice President Southeast Region, Session #266) presented along with their Lieutenant Moose Sims and Sergeant Eric Spitzer on updates to the Use of Force. One of our newer graduates, Anchorage Police Department Captain Sean Case (Session #272) spoke on the “Net Generation.” John Campanella (Session #239) presented on “Mitigating Police Fatigue,” and Dr. Mitch Javidi, Chancellor of the National Command & Staff College spoke for a day and a half on “MAGNUS Leadership.” As gifts of appreciation, the speakers received an engraved Yeti mug with the NA seal. National President Johnnie Adams had a delay with his flight, however, he made it to Anchorage in time for our annual Christmas party and the last day of Dr. Javidi’s class. President Adams was recognized by Dr. Javidi for being a MAGNUS leader for the efforts he made in coming to Alaska and supporting the Alaska Chapter. Sitting next to Johnnie, he said that he felt his face was red, but Dr. Javidi was spot on. Johnnie is our humble leader. We had excellent financial partners with the Alaska Association of Chiefs of Police, the Alaska Police Standards Council, 5.11 Tactical, and the Hilton Garden Inn. After a lunch break on Friday, I was recognized by the members of the board of directors for my service as President for the past two years. The Chapter held their annual Christmas party on December 6th. We usually do a white elephant type of gift exchange, but opted for something different by rolling great big dice to see if we keep the gift or pass it on. Many thanks to Leonard (Skip) Coile (Session #163) and his wife, Patty for handling the party games. Skip was given a Yeti mug in recognition of being our emcee for so many years. We usually have a theme for our party and this year it was “Space: The Final Frontier in the Last Frontier.” Costumes were not required, but comfort was strongly recommended. Howard chose comfort. Johnnie bought his lighted Star Wars Christmas sweater for the party. Shirley is an alien. Thanks again to Howard and Johnnie for traveling to Alaska and spending so much quality time with the members of our Chapter. We were truly honored as this was a first for us, and although we are a small chapter they made us feel very important. Thank you, as well to all the staff at the National Academy who always give us immediate, friendly, and competent assistance whenever we have the need. I have enjoyed my time as a member of the chapter and serving intermittently over a long span of time as the Secretary/Treasurer, Vice President of the Southcentral Region, Training Committee Chair and other committees appointed by then President Terry Vrabec (Session #186) who very appreciatively served as President for 16 years. It was a lot of work, but our board of directors and our members made every minute worth the effort. On a different note, I would like to recognize and thank the FBI NAA Charitable Foundation for helping me to recover from the destruction to my home from the November 30th earthquake. When Johnnie called to see how we were doing in the aftermath I told him what had happened to my house. I had seen Doug Muldoon’s email to the members offering support from the Foundation for any members suffering from the effects of the earthquake, but I didn’t think that it might mean me. When Johnnie said, “Don’t forget the Foundation,” I decided to contact Doug. Within a couple of days I received confirmation from Doug that the Foundation would help. I will never forget the emotional and financial assistance I received, and during the time when I was trying to put on a conference. There are no words to convey the level of my gratitude. The Sept/Oct 2018 Issue of Associate Magazine is available. Read about the history of the FBINAA and the beginning of this fraternal alumni Association that has grown into an international organization of nearly 17,000 members in our Historian Spotlight. Here’s the link to the issue. This year, the FBI National Academy Associates is searching for one (1) Counselor from Section 1 and two (2) Counselors from Section 3 for the 2019 session of the Youth Leadership Program (YLP). YLP Session #21 is scheduled from June 20, 2019 thru June 28, 2019 and will require full time participation from the newly selected Counselor during that time-frame. Staff will be required to be on site June 18, 2019 through June 29, 2019. Some additional off-site time commitment will also be required for preparation prior to the start of the session. Also, any interested candidate should recognize that a four year commitment to the YLP Program is expected. While YLP is in session, Counselors are required to be on duty at 0500 hours with lights out for the students typically occurring at 2130 hours after which the Staff remains on duty, holds nightly debriefing meetings and secures the dormitory floor. Nominations must be made through the applicant's Chapter. Individuals interested in being considered for this Counselor position must file a letter of interest, Curriculum Vitae or Resume and letters of support to their Chapter President no later than November 30, 2018. Chapter Presidents upon review of applications from their chapter, shall nominate two (2) candidate to the Section 1 Representatives and four (4) candidates to the Section 3 Representative by December 7, 2018. The successful applicant will be notified on or before February 1, 2019. YLP Counselors are limited to a four year term to permit rotation of counselors while ensuring that succession planning is carried out. Anyone with questions about the selection process may contact me or their Section Representative. The Alaska Chapter Board of Directors is appreciative of the efforts of the National Office’s John Kennedy, Director of Education and Training and Joe Collins, Co-chair of the Officer Safety and Wellness Committee for working diligently with us to bring the Comprehensive Officer Resiliency Train-the-Trainer program to Alaska. 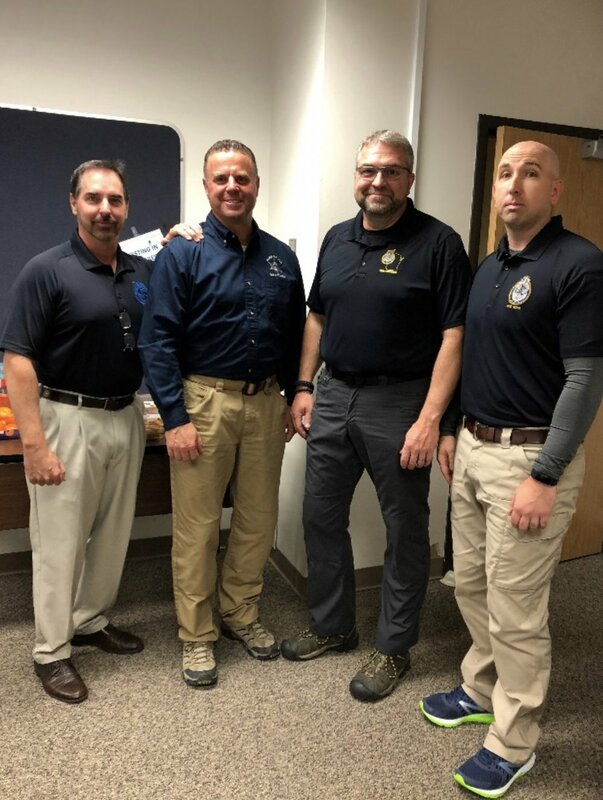 Eighteen trainers from around the state from various agencies came together at the Anchorage Police Department Training Center to receive the team teaching from instructors Buddy Johnson (Georgia), Ron Winegar (Idaho), Joe Collins (Wisconsin) and Vinny Greany (New York). The two and a half days of training has prepared our trainers to incorporate officer resiliency into the values of their departments, families, and communities. Two of our members, Tom Dunn (Session #253) and Joe Gamache (Session #272) joined 16 other troopers, officers, supervisors and commanders in preparing to share the vital knowledge toward improving the quality of life in Alaska. Joe set up a group email and several trainers are already reporting using the lessons learned. Thank you to Motorola, Acadia Healthcare, Alaska Police Standards Council, Department of Public Safety, Alaska Association of Chiefs of Police, Anchorage Police Department and our Alaska Chapter for the financial assistance in making this happen. A special thanks to our Vice President of the Southcentral Region and Training Committee Chair, Barry Wilson (Session # 244) for helping me to spearhead and host this valuable training. Now that the officer resiliency training is wrapped up, our focus has turned fully to organizing the Executive Development Conference to be held at the Hilton Garden Inn in Anchorage December 5-7, 2019. Our general membership meeting will be held on Tuesday, December 4th at 3:00 p.m. Go to our website https://fbinaaak.org for a schedule of events and presentations. Although our space is limited we welcome members from outside Alaska to join us in our excellent training and networking. The theme for our annual Christmas party to be held on Thursday, December 6, 2018 at the Hilton Garden Inn is “Space: The Final Frontier in the Last Frontier.” Wear your space clothes for a good time in between the serious and important training that will be delivered. Elections will be held this year with Barry Wilson (Session # 244) running for the two-year term of President and Sean McGee (Session #202) running as the incumbent for his two-year term of Vice President of the Northern Region. Sean will also be the Alaska Chapter’s Youth Leadership Program Coordinator for 2019. After being in Alaska for 42 years I am wrapping up and moving to Colorado, hopefully next summer. I could not have asked for a more successful law enforcement career than what I experienced in the great state of Alaska. I have enjoyed my many years of involvement in the Alaska Chapter, and I look forward to joining the Rocky Mountain Chapter. The Alaska High Intensity Drug Trafficking Area (Alaska HIDTA) Executive Board is soliciting applications for the position of Director - Alaska HIDTA. This position is a management level position with programmatic responsibility over the operations of the Alaska HIDTA, its various initiatives and management staff. More information on the position is available via this link. Please note, the listing closes on 10/17/2018 at 5:00 PM Alaska. Waqaa! (Hello in Yupik) from the Alaska Chapter. Our Secretary/Treasurer, Captain Andrew Merrill, Alaska State Troopers (Session #257) and I were fortunate to have been able to attend the FBI National Academy Associates’ Chapter Officers’ meeting at Quantico March 5-8, 2018. We found the meetings to be well-structured and informative. Thank you to President Scott Dumas and the National Board for your presentations and demonstrated excellent leadership and support of the Chapters. Thank you to Executive Director Howard Cook, also for his excellent leadership, and to his friendly, helpful, and competent Staff. Andrew and I brought back many good ideas and important information to our Executive Board. The willingness to share by other chapter officers, along with the leadership of President Dumas, Section I Representative Braniff, Executive Director Cook, and the rest of the board and staff recharged my energy to build upon our extremely high level of excellence, professionalism, and communications. Andrew and I appreciated and seized the opportunity to meet with our two newest members of the chapter and graduates of Session #271 – Corey Rowley, Chief of Police for the Yakutat Borough Police Department and Lt. John McKinnon from the Anchorage Police Department. We had dinner at the Globe and Laurel and we had plenty of time to talk. We enjoyed hearing about their favorite classes and other experiences, and we’re looking forward to their involvement in our Chapter. We are pleased to announce that our Chapter is a $1000 donor to the FBINAA Charitable Foundation. We support the mission of helping our brothers and sisters in law enforcement when they need help just as much as the people they are helping. We appreciate the presentation of Chairman Doug Muldoon and the commitment to expediently come to the aide of those least likely to ask for help. The bi-annual membership meeting will take place on May 7th starting at 3:00 p.m. in Fairbanks. We look forward to seeing our members from the Interior who cannot always make the annual meeting in Anchorage in December. We are pleased to be able to send three of our members to the National Conference in Quebec City. Two of our board members, Barry Wilson (Session #244) and Chad Goeden (Session #266) plan to attend along with another member, yet to be selected. My name is Shirley Coté (Session #164) and it is my pleasure to start the second year of a two-year term as the President of the Alaska Chapter. I announced the results of our election in the last edition of Chapter Chat, and I am committed to, and looking forward to working hard again this year with our very involved Executive Board. We meet once a month on the third Friday for about an hour to ensure we are all on track with the work that needs to be done from our committees. Vice President for Southcentral Region, Barry Wilson (Session #244) chairs the Training Committee; Vice President for Southeast Chad Goeden (Session #266) and Vice President Sean McGee (Session #202) co-chair the Constitution and Bylaws Committee; Chad chairs the Membership Committee; Sean chairs the Social Outreach Committee; and per our Bylaws I serve as a member on all committees. Secretary/Treasurer Andrew Merrill (Session #257) has already hit the ground running and is promoting the need for past members to pay their 2018 dues. We are a small chapter with a potential of about 150 members. We ended the year with about half that number, but through the efforts of Chad's Membership Committee, and Andrew who serves on the committee, we expect to increase that number. Chapter dues are $15.00. Last year Fairbanks P.D. Deputy Chief Dan Welborn (Session #267) chaired the Fundraising Committee and he and I were hugely successful in obtaining donated prizes and funds in Fairbanks and Anchorage, respectively, in an effort to sell raffle tickets to support our training. In addition to Dan and I, members Lance Jamison-Ewers (Session #267), Greg Russell (Session #180), Chad Goeden, Barry Wilson, Maurice Hughes (Session #261), Sean McGee (Session #202), Mike Holman (Session #251), Jennifer Shockley (Session #263), Ed Mercer (Session #259), Tony April (Session #226), Bob Beasley (Session #194), Skip Coile (Session #163), Ronda Wallace (Session #250), and Dave Ross (Session #256) did a tremendous job in selling raffle tickets. We have an impressive commitment from our members to ensure our chapter continues to thrive and be beneficial to the members. Our next membership meeting will be held in Fairbanks on May 7, 2018 from 3:00 p.m. to 4:30 p.m. and all members plan to attend, to include our Past President, Terry Vrabec (Session #186) who now lives in Arizona. Terry has been very active with our board work. Once again this year, we will be selecting a member to attend the National Conference, which is being held in Quebec City. Our Training Committee Chair and Vice President Barry Wilson and I also plan to attend. We are looking forward to attending the training sessions and hope to contribute good information to the Training Committee upon our return. We are also looking forward to networking with our fellow National Academy graduates and members of the FBI NAA. In November 2017 I was contacted by Jennifer Watson, Member Services Manager for the FBI NAA. Jennifer requested feedback from the Alaska Chapter that could be presented to the National Board of Directors in consideration of Mr. Ritzman's application for membership. The members of the Alaska Chapter voted unanimously that Mr. Ritzman met the criteria and he was eventually approved by the National Board. We are proud to have Mr. Ritzman as a member as he has been deeply involved in the Alaska Chapter since his arrival as the Special Agent in Charge of FBI's Anchorage Division since March 10, 2016. Mr. Ritzman most recently served as Section Chief of Transnational Organized Crime-Western Hemisphere, Criminal Investigative Division. Mr. Ritzman entered on duty with the FBI in 1990. Following graduation from the FBI Academy, he was assigned to the Kansas City Division where he investigated organized crime and drug matters. In 1997 Mr. Ritzman transferred to the FBI's Hostage Rescue Team (HRT) where he served as an Assault Team Leader until 2004. 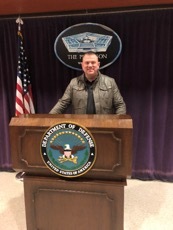 During Mr. Ritzman's tenure with HRT he completed multiple critical TDY assignments around the world to include: Afghanistan, Kosovo, Iraq, and Yemen. In 2004 he transferred to the Jefferson City RA, Kansas City Division, where he worked a variety of violations with emphasis on violent crime and gang matters. In 2006 Mr. Ritzman was appointed Assistant Legal Attaché in Islamabad Pakistan where he worked significant counterterrorism and liaison matters, he served there until 2007. In November 2009, Mr. Ritzman was promoted to Supervisory Special Agent and was transferred to Headquarters City, Kansas City Division where he supervised the Violent Crime Squad including, a Fugitive Task Force, and Child Exploitation Task Force. 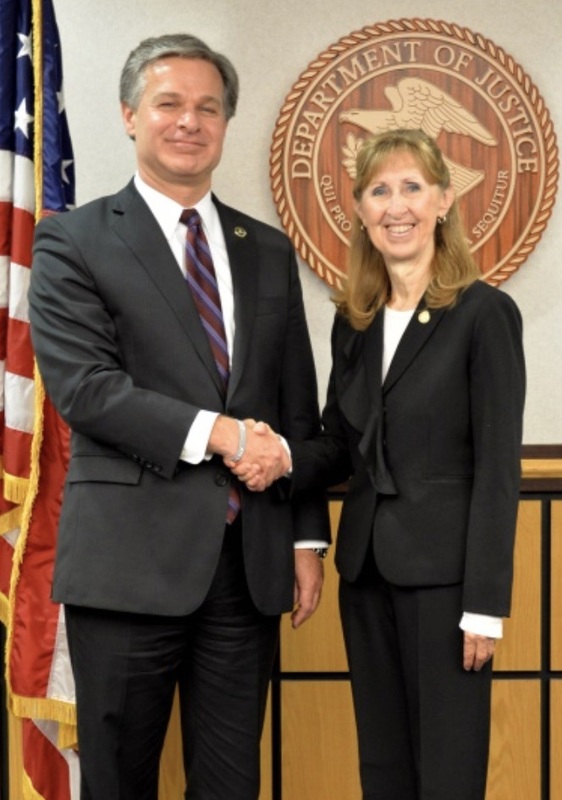 In August 2013 Mr. Ritzman was promoted to Assistant Special Agent in Charge of the Kansas City Division where he managed all Criminal programs and the Administrative Branch. In July 2015 Mr. Ritzman was appointed as the Section Chief of Transnational Organized Crime- Western Hemisphere, Criminal Investigative Division at FBI Headquarters, where he was responsible for leading and overseeing programs involving Transnational Organized Crimes in the Western Hemisphere. Mr. Ritzman is a certified SWAT Agent, and a Firearms and Police instructor. Mr. Ritzman is the recipient of the FBI's Shield of Bravery. Mr. Ritzman is a native of Nebraska and earned a Bachelor of Arts Degree from the University of Nebraska in 1985. He served in the United States Army as an Infantry Officer for 5 years prior to joining the FBI. Mr. Ritzman is married to Juliette Ritzman, who also works for the FBI's Anchorage Division. Their two sons Austin and Garrett are serving as Infantry Officers in the United States Army. On January 31, 2018, Michael Holman (Session #251) retired from the Unalaska Department of Public Safety where he served since 1995. He rose through the ranks from patrol officer to patrol sergeant to deputy police chief and finally, Director. Prior to being hired in Unalaska, Mike he served in the Army as an air cavalry scout in the 82nd Airborne Division, and worked for the Alaska Department of Fish & Game while attending the University of Alaska, Anchorage. Director Holman attended the Alaska Law Enforcement Training Session #16 in Sitka, Alaska, and in 2012 he the FBI National Academy. He holds an Advanced Police Certificate through the Alaska Police Standards Council; is a certified Police Instructor in multiple disciplines; and currently holds a Bachelor of Arts degree in Organizational Management and a Master of Public Administration degree through Ashford University. Director Holman is an active member of the Alaska Association of Chiefs of Police. He is involved with several AACOP committees that include the legislative committee, the bylaws and policy committee, and marijuana ad-hoc committee. He has served as a committee chair, as a member of the board of directors, and in the fall of 2015 he was appointed to fill the vice president seat. He is also an active member of the Aleutian Islands chapter of the Alaska Peace Officers Association, the Unalaska Fish & Game Advisory Committee, the Aleutian/Pribilof Islands Local Emergency Preparedness Committee, and is a vice president of the Ballyhoo Lions Club. In addition to being an active member of the AACOP, Director Holman is an active member of the FBI National Academy Associates, Alaska Chapter. He currently serves on the Selection Committee for the Youth Leadership Program for the Alaska. His daughter, Taylor was an attendee of the 17th session YLP in June 2015, prior to Director Holman's commitment to serve on the committee. Through Taylor's experience Director Holman clearly understands the value of the program in our young Alaskan attendees' lives. Mike and his family will remain in the state and will be moving from Unalaska to Palmer. 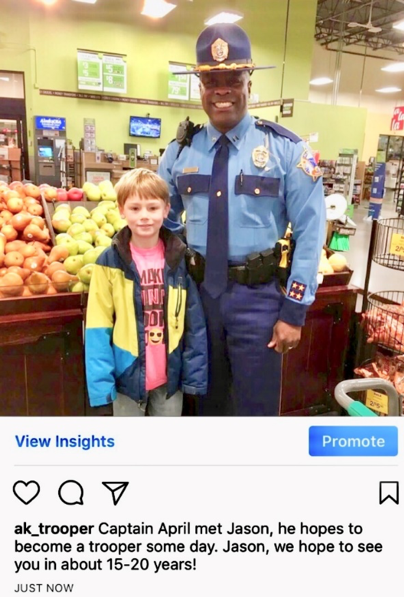 Captain Anthony April (Session #226) from the Alaska State Troopers is very active in his community of the Matanuska-Susitna Borough, aka "The Valley". Captain April is featured in a new book by authors Matthew Horace and Ron Harris entitled, "The Black and the Blue: A cop reveals the crimes and racism in America's law enforcement and the search for change." In the section dedicated to Captain April they talk about his upbringing in Miami and his rise to the rank of captain with the Alaska State Troopers. FBINAA Alaska Chapter representing- Alaska State Troopers- Capt. Barry Wilson (not pictured), Session #244, Capt. Andrew Merrill, Session #257 (representing in the green NA PT shorts), Lt. Derek DeGraaf, Session #266 and Lt. Paul Fussey Session #269 (both in Black NA PT shorts), accompanied by State Fire Marshal Lloyd Nakano. “Freezin for a Reason” Alaska Special Olympics Polar Plunge fundraiser (this law enforcement partnership with Special Olympics raises more than $200,000 every year for Special Olympic athletes. On December 5, 2017, during the bi-annual membership meeting, Special Agent in Charge of the Anchorage Field Office of the FBI swore in the newly elected board members. Chad Goeden, Session #266 (left) ran for his seat again as the Vice President of the Southeast Region, Andrew Merrill Session #257 (middle) ran for Secretary/Treasurer after Bob Beasley, Session #194 decided not to run, and Barry Wilson, Session #244 (right) ran for his seat again as the Vice President of the Southcentral Region. Shirley A. Coté, President and Sean McGee, Vice President of the Northern Region have one year left in their terms. Terry Vrabec remains the Past President. Bob Beasley, Session #194 was presented with a plaque of appreciation by President Shirley Coté, Session #164 for the past year as the Secretary/Treasurer. On December 7, 2017 Training Specialist Lacy Wolff and Lt. Melvin Allick from the Texas Department of Public Safety presented Executive S.H.I.E.L.D. – Strength and Honor in Everyday Leadership Decisions. We had altogether eight excellent presenters at the annual Executive Development Conference held at the Dimond Center Hotel December 6-8, 2017. We had 90 supervisors, commanders, and chiefs registered for the conference. Two came from outside the state – Greg Olson, Session #174 from Oregon and Bob Pence, SAC Retired and Active member from Colorado. Every year we hold our themed Christmas Party on the Thursday evening during the conference. This year the theme was “Back to the 80’s” and our costume winner was Ronda Wallace (left), Session #250. Ronda always participates in our parties and with all the gusto we expect from our members. Runners up were Morgan Warner and Zach Carbaugh. Morgan is Shirley’s daughter who helped in decorating and buying gifts for the party. She has been attending with Shirley for many years because it’s the best Christmas party in town!